I love using Twitter. I like getting news at the moment, interacting with people and celebrities (especially Survivors and MasterChefs) even for just a few Tweets. But it has become clear – day after day – that less and less people use Twitter. It has become a “Share Also” by posts on Facebook and Instagram. I don’t want to see my timeline full of half-captions and links to Instagram. I want Twitter. So here are some unsolicited suggestions. Keep things on Twitter. When we see links to Instagram or Facebook, we click them and leave Twitter. And usually, we don’t come back. IG and FB hook you in and you stay there. But if those IG and FB links open on Twitter (just like it did before), then people will stay on Twitter and comment there. Eventually, they will start using the photo editing features of Twitter as well – and then share on FB (how about IG?) instead of the other way around. Make it easier to switch between accounts. I use Tweetdeck to manage accounts. But Tweetdeck keeps you away from the Twitter homepage. And it is very different. 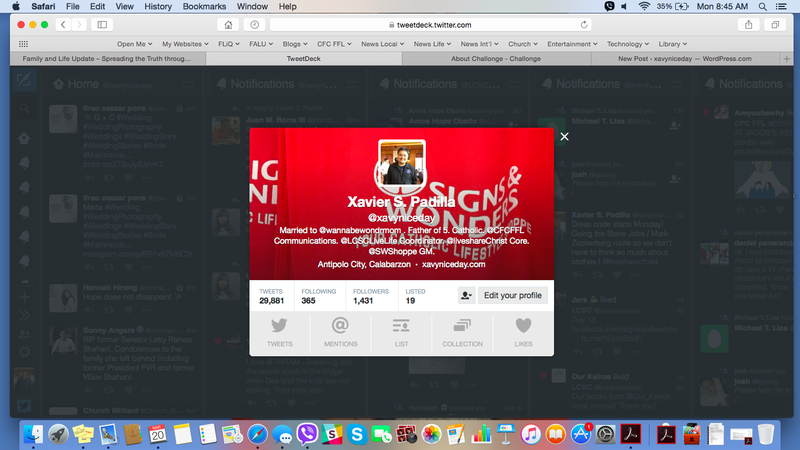 Make it easier to switch between accounts using the Twitter homepage. Without having to log in and out all the time. If you give us the option to merge Twitter names, even better! Bring back Vine and make it like Periscope. Vine was great! It made superstars. Bring it back! But keep it in Twitter, just like Periscope. Much like IG has their looping videos and live streaming, you have Vine and Periscope. You did it first, after all. Pivot to Asia. Asia loves tweeting! Why not put up offices around Asia and engage with us Asians more. The Philippines beats records when it comes to tweeting! Improve Lists. Lists can be improved to Groups and have more interaction based on certain topics and interests. But still on Twitter itself. We’d like to see that too! Also, one last thing, have some merchandise. Have a store! I went to San Francisco recently, went to Twitter headquarters, and looked for a store. The front desk wasn’t very accommodating, and it didn’t feel homey. Make us users feel better when we visit you. Especially from thousands of miles away. We don’t want Twitter to die.